Seeing a spike in your company's turnover will probably cause a spike in your blood pressure. No one wants their business to be a revolving door. One thing that helps: arming yourself with insights. Once you have the data to anticipate turnover, you can act to retain key employees and recruit new ones way ahead of time. It’s the difference between constantly reacting and proactively planning. 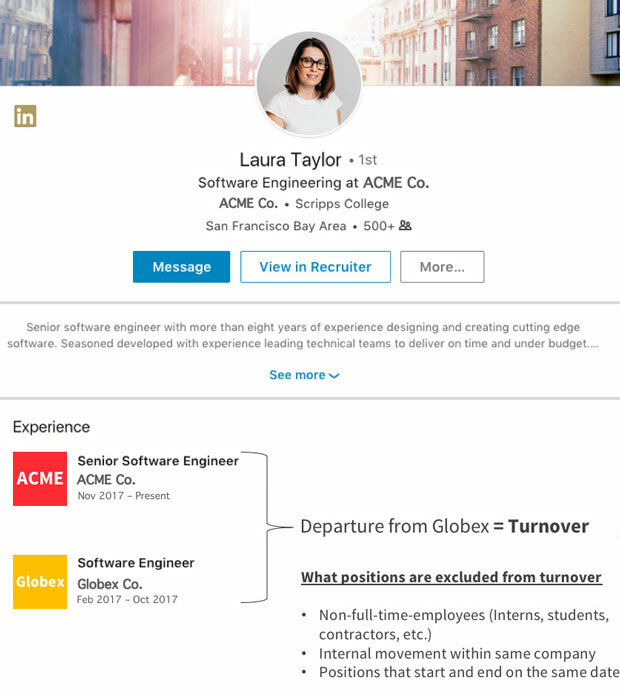 That’s why we’re giving you the latest insights on the sectors, industries, and jobs seeing the highest levels of turnover, based on LinkedIn’s data on half-a-billion professionals. Insight #1: our analysis finds a worldwide turnover rate of 10.9%, defined as the percent of LinkedIn members who indicated they left a company in 2017. Read on to discover where it’s hardest to hold on to talent—along with helpful examples of how companies have used turnover data to keep their employees and plan ahead, complete with tips to help you do the same. Tech companies (software, not hardware) had the most turnover over in 2017 with a 13.2% rate. 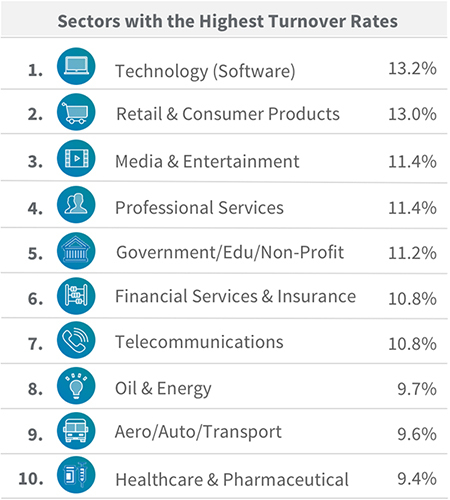 Retail—a historically high-churn sector—follows closely behind at 13.0%, while media/entertainment (11.4%), professional services (11.4%), and government/education/nonprofit (11.2%) round out the top five. 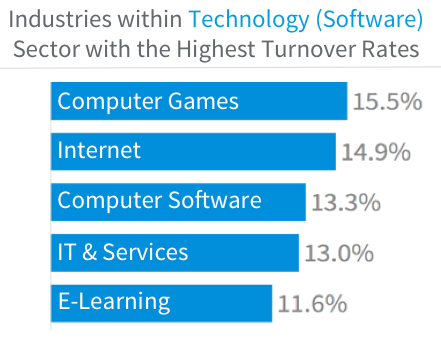 Over the last few years, these sectors have consistently seen the highest turnover rates. While tech, retail, and media may have the most “liquid” workforces, each one sees talent turnover for very different reasons. Let’s take a closer look at the industries and jobs driving turnover within these spaces. If you work in tech, retail, or media, these insights will help you see where you stack up—but even if you don’t, you’ll gain a better understanding of the talent landscape and the forces shaping it. The computer games (15.5%), Internet (14.9%), and computer software industries (13.3%) drove tech turnover the most—but those rates pale in comparison to the churn you see within particular occupations. User experience designers had extremely high turnover at 23.3% (they’re also extremely in-demand), with both data analysts and embedded software engineers at 21.7%. In fact, embedded software engineers receive the most InMails per person of any occupation in North America. There’s good evidence to suggest that the trouble with retaining tech talent is high-demand and rising compensation within the industry: as employers and offers get more competitive, top talent is more eager to jump on new opportunities. The numbers support this theory: according to LinkedIn data, almost half (49%) of departing tech employees take another job within the tech sector. 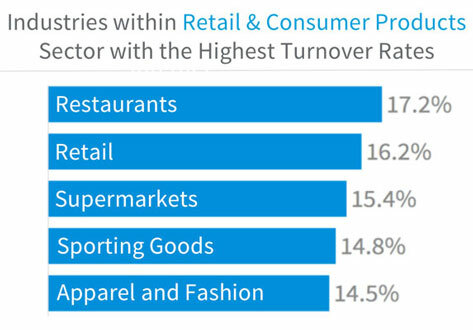 The industries with the highest levels of turnover here aren’t terribly surprising, with restaurants (17.2%), retail (16.2%), and supermarkets (15.4%) leading the way. The roles that people left the most include lower-level, often-seasonal jobs, like retail salesperson (19.3%), food service professional (17.6%), and hospitality professional (17.0%). The revolving door of retail may have clearer causes. The industry traditionally sees high turnover, and with the rise of online shopping, companies need far fewer people on the floors. Many former salespeople have to find completely new careers: only 35% of people leaving jobs in retail stay within the sector, according to our data. 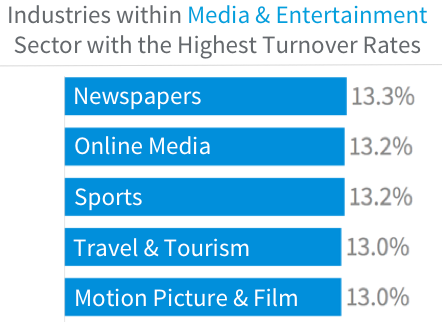 There’s no single industry within media and entertainment that’s driving turnover—newspapers (13.3%), online media (13.2%), and sports (13.2%) are all neck-and-neck. But the same can’t be said for occupations: animators (25.6%) and 3D artists (22.3%) both have turnover rates more than double the global average (both of these jobs are in high demand). Marketing specialists (19.8%) within Media and Entertainment see the third-most turnover. Most people leaving jobs in media/entertainment also leave the sector itself: just 36% of job-leavers go to another job in the media/entertainment sector. One reason why the sector may see so much turnover: it’s extraordinarily project-focused. Whether it’s motion pictures, music, or sports, the work revolves around projects with definite beginnings and ends (e.g., movies, albums, playoffs). Talent needs would naturally ebb and flow faster here than other sectors, resulting in more turnover. Turnover isn’t bad by nature, but it’s obviously costly when your most valuable people leave. By paying attention to why employees leave and appealing to what they care about most, HR pros can retain talent more effectively and recruiters can replace those who do leave. We surveyed over 10,000 people who recently changed jobs to see why they left. 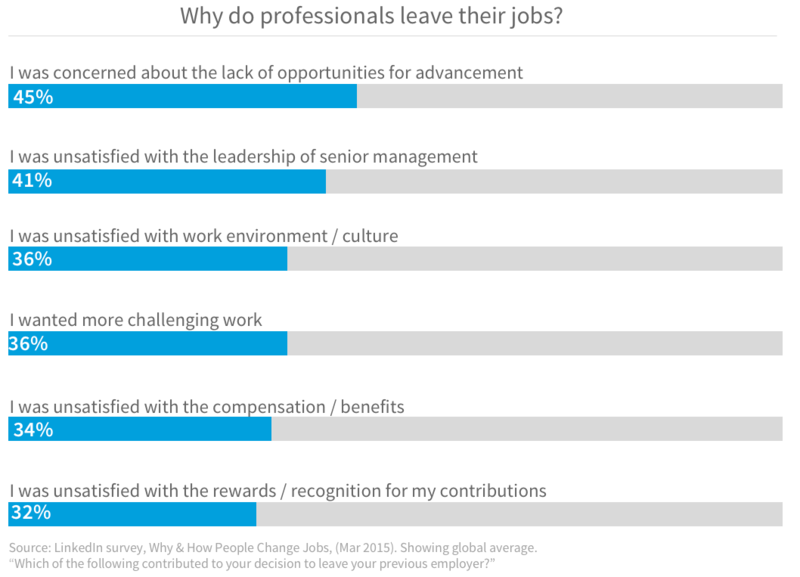 The top reason people leave: a lack of opportunities for advancement (45%). The other biggest reasons people jumped included being unhappy with leadership (41%), being unhappy with the work environment (36%), and a desire for more challenging work (36%). While these sweeping trends can definitely inform your approach to turnover, every organization is different. It’s absolutely essential to look at your own data—whether that’s turnover metrics or employee surveys—in order to understand and address the causes of turnover. Here’s how three brands have taken different data-driven approaches to retention. 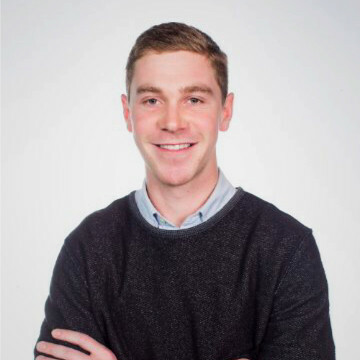 At LinkedIn, for instance, after talking to hundreds of our top engineers, we found that something as simple as a few conversations could have a major impact on retention rates. By encouraging managers to have more career-focused conversations with employees, attrition rates for those engineers plummeted to 5.5%. Similarly, when leaders at Nielsen analyzed their retention data, they saw that employees who made lateral career moves within the company tended to stay much longer. In fact, they found that moving employees laterally was nearly as effective as giving them a promotion. Snacking brand Hershey is building an impressive model that can predict employee retention with 87% accuracy. For example, they found that remote workers and those who have had multiple managers in a short period were much less likely to stay. The company uses these insights both to help retain valuable at-risk employees and to recruit new talent ahead of time to stay fully staffed for their busy seasons (Halloween and Easter, of course). In each of these cases, companies found relatively simple ways to keep employees and plan ahead—just by engaging their people, analyzing their own data, and executing a clear action plan. Depending on the insights you find, the action you take could be anything from career coaching to lateral job moves: 94% of employees say they’d stay longer if a company invested in their career. Professional development resources like LinkedIn Learning can encourage employees to gain new skills and advance their careers without leaving the company. Turnover can be from a healthy, increasingly competitive industry, like tech, or one that’s rapidly changing, like retail. But even when there’s turnover for all the right reasons, turnover poses real challenges to TA and HR teams. The right insights can help you mitigate those problems, improve retention, and attract more of the talent you need. Turnover rates are drawn from LinkedIn’s member data. We calculate turnover by taking the number of departures/movement in a given population (e.g., the retail sector, the restaurant industry, or data analysts), then dividing that number by the average headcount of that given population in 2017. We consider professionals as leaving their position if they provide an end-date for their position at a company (excluding internal job changes within the same company). A member can have multiple departures and positions within the year period.